Since opening its doors in 1915, JAG’s Lutyens home on the edge of Joubert Park has remained at the epicentre of the Johannesburg’s art establishment. With the flight of capital from the Johannesburg inner city during the 90s, support for both JAG and FOJ also dwindled. In 2014 ago Marianne Fassler, in collaboration with Breinstorm Brand Architects (BBA), initiated a revival drive for the Friends of JAG, and restore and expand the organisation’s important role in supporting JAG. Our vision for this expanded role goes beyond fundraising and includes audience building, promotion of JAG’s activities, custodianship and ambassadorship of the JAG brand and legacy, and setting up sustainable mutually beneficial partnerships between corporate benefactors and JAG. A newly created dedicated website, that ties in with social media, mailer promotions and a regular electronic newsletter, gave Friends of JAG and the Gallery a much needed online presence. BBA plays an active role in creating public-, local government- and corporate awareness around JAG and the challenges the institution faces. 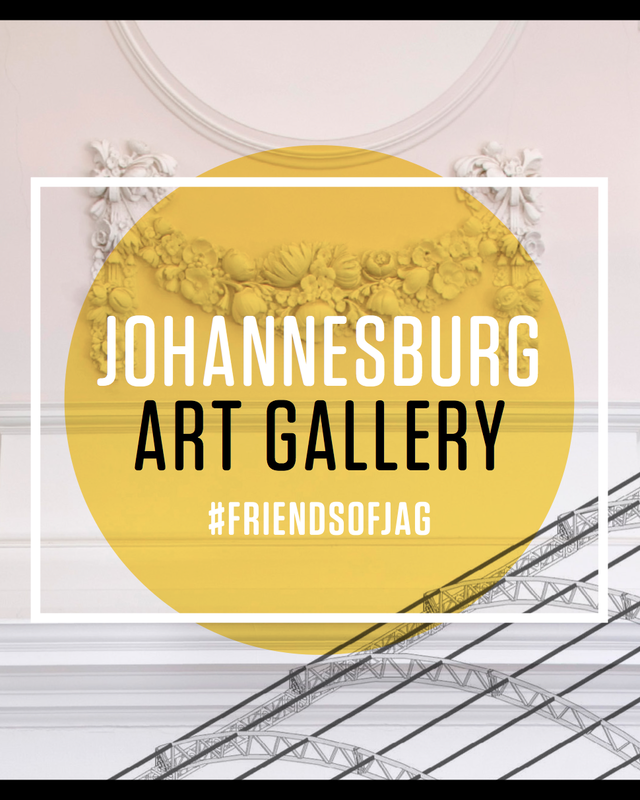 We have also since grown the scope our pro-bono work for Friends of JAG Most recently we conceptualised activations that tie in with JAG exhibitions in order to promote, engage and reach new audiences e.g. a crowd sourced activation to tie in with JAG’s summer exhibition, The Evidence of Things Not Seen. The online submission platform offered the public the opportunity to submit their own portraits and have it live-streamed during the opening, and the duration of the exhibition, as well as online on the FOJ website. The FOJ and BBA assist in press liaison and the promotion of JAG events and opening. We design exhibition related collateral, social media elements and also prepare online catalogues of recent exhibitions. #MuseumWeek was launched to be the first worldwide cultural event on Twitter. It has since grown into an annual international online event devoted to the celebration of culture by cultural institutions. For JAG’s participation in 2016 we designed image templates to include Gallery branding and visually tie diverse themes into a coherent system. JAG’s Lutyens home on the edge of Joubert Park has remained at the epicentre of the Johannesburg’s art establishment. In 2015 JAG celebrated the centenary of its original Edwin Lutyens building with a series of events and exhibitions. For JAG’s centenary celebrations Breinstorm Brand Architects facilitated a collaboration between the South African Mint (SA Mint) and the Friends of JAG. We conceptualised three special limited edition sterling silver commemorative medallions to mark this auspicious occasion. A percentage of sales proceeds generated benefitted the important supporting role played by Friends of JAG in the everyday functioning of the Gallery. The medallions, which were unveiled to the public at the 2015 FNB Joburg Art Fair, Sandton Convention Centre, are a beautifully designed and expertly crafted homage to JAG’s original Lutyens building and the impressive public art collection it houses. Different aspects of Lutyens’ neo-classical architectural motives, found in the JAG building, are featured on the obverse of the three medallions and was designed by Breinstorm inhouse designer Jana Jansen van Vuuren. To tie in with the architectural motives the reverse sides of the medallions, designed by renowned South African graphic artists Sindiso Nyoni, feature prominent sculptural pieces from the JAG collection. The launch activation included a display mural showcasing the medallions and an iPad app that allowed purchase orders as well as membership sign-up for Friends of JAG. The collaborative initiative served to re-invigorate the Friends of JAG securing much needed funding and attracting new members to the organisation. The Johannesburg Art Gallery Centenary commemorative medallions provided the JAG with a valuable tangible memento, exposure to an important new sector of collectors, and also provided free publicity for the Gallery and its centenary celebrations. The association with JAG benefitted SA Mint by positioning the organisation as a player in the South African creative industries sector. BBA plays an active role in creating public-, local government- and corporate awareness around JAG and the challenges the institution faces. In our support for JAG, we have managed to arrange mutually beneficial corporate memberships that contribute to the improvement of JAG’s infrastructure. In collaboration with the Friends of JAG we endeavour to develop new collaborative approaches to sharing and developing JAG’s collections and promote its legacy. A recent example was a partnership with BoA that saw the restoration of the Gallery’s important collection of Gerard Sekoto paintings and upgrading function facilities.